If you haven’t already read the lesson on the major scale and you’re not familiar with the major scale, I would recommend doing so now and coming back to this lesson. This lesson will make much more sense if you first have an understanding of the major scale. 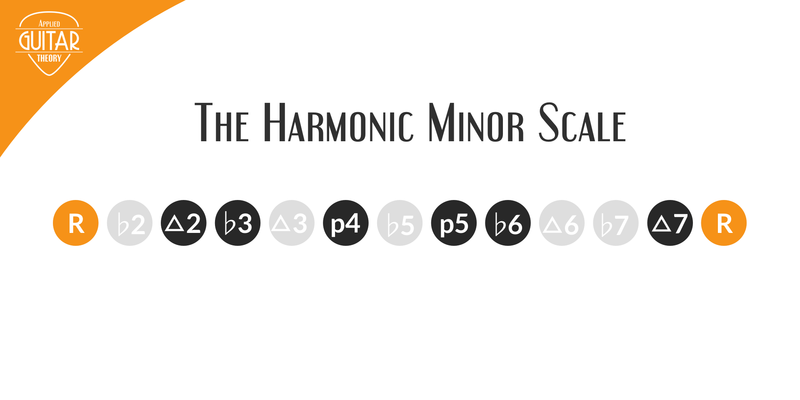 There are a few different minor scales: natural minor, melodic minor, and harmonic minor. In this lesson, we are only learning about the natural minor. 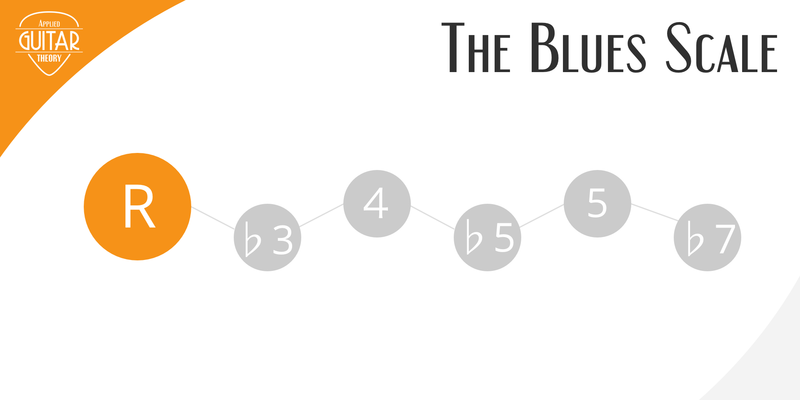 Unlike the major scale that is bright and happy, the minor scale has a sad and emotional feel to it. Like the major scale, it, too, is a diatonic scale consisting of 7 notes and an octave note. So what makes this scale different? The difference lies in the 3rd degree of the scale. The major scale contains a major 3rd. That is, the 3rd of the major scale is 2 whole steps away from the root. The minor scale, however, contains a minor, or flattened 3rd degree that is 1 1/2 steps away from the root. You can construct the minor scale in any key by following this formula of whole/half steps. Using the G minor scale from above, below is the first position of the scale. Again, in these examples we are using the CAGED system. You can find the positions for 3 notes per string in the resource section at the end of the lesson. Play all of these patterns ascending and descending across the neck, being sure to play all notes and ending on the root. 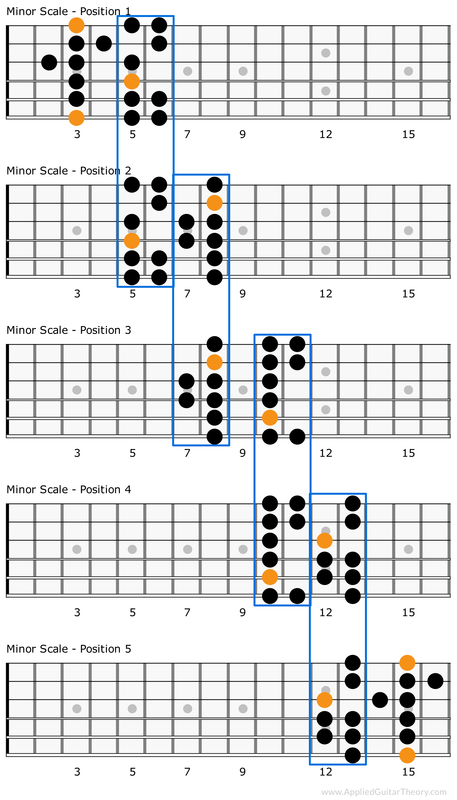 Like the major scale, these patterns are connected via shared notes above and below the position. 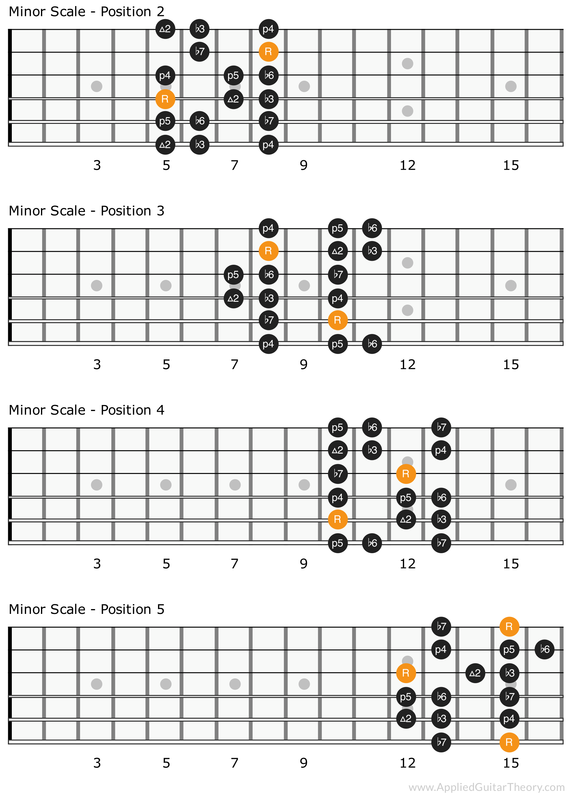 Similar to the major scale, these patterns hold true for any minor scale. If you examine these patterns closely, you’ll also notice they are exactly the same as the patterns for the major scale. The only difference is the root note for the pattern. 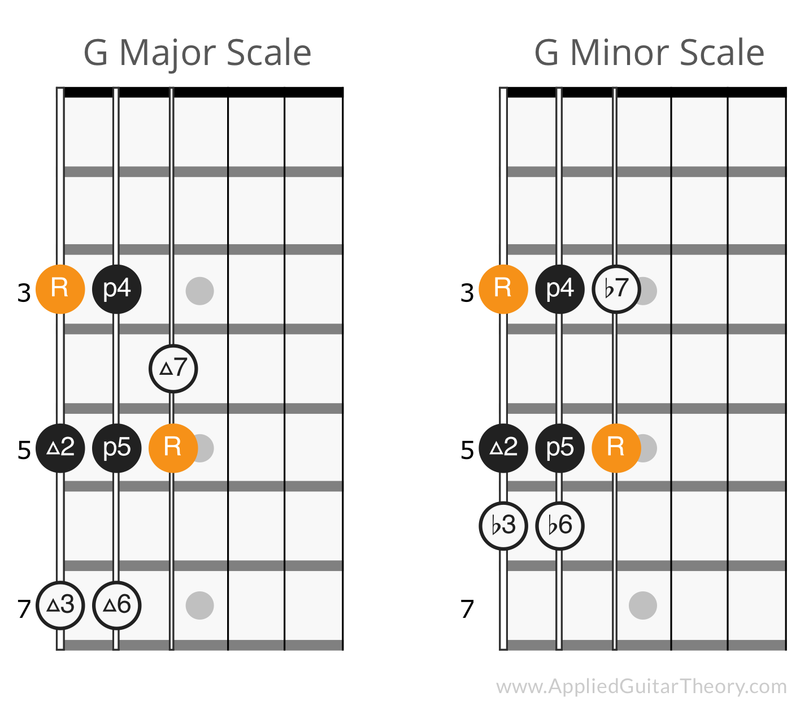 This is because of the relationship between the relative major/minor scales, which we take a look at in the following lesson: The Relative Major/Minor. In this lesson we learned about the natural minor scale and how it is created by lowering the 3rd degree of the major scale. By doing this, we end up with flattened notes at the 3rd, 6th, and 7th degrees of the scale. This, in turn, produces a tonality that is more dark and sad than that of the major scale.